AWIS provides each crew member with the ability to communicate wirelessly in flight and in roles such as fire guard or the collection of litters in casualty evacuation. It will be equipped on every UH-60 Blackhawk A, L and M in the fleet and the CH-47 D and F Chinook. The Navy are also using the AWIS systems and Lt. Col. Klinkhammer notes that they have already had success using the unencrypted version and, “have saved lives.” Navy helicopter crews are also using Air Warrior's EDM, buying additional units from the same contract, leveraging reduced costs across the two Services. Although PM AW is buying and issuing CEPS, by putting CEPS on the GSA as a catalogued and certified piece of equipment, units will be able to buy the item directly with unit technicians adding the systems to the flight helmet as a Modification Work Order. Foreign Military Sales orders for Air Warrior equipment have already been made for several nations including Australia, Canada and three Middle Eastern customers. Beyond Air Warrior, which is approaching transition from acquisition to sustainment, is the follow-on Air Soldier programme, which will be delivered in three increments. The first increment of Air Soldier will field to the first Army aviation unit in the 2013 timeframe. The next increment will follow in the 2015 timeframe and the final increment is scheduled for 2018. Lt. Col. Klinkhammer said, “Air Warrior is still the overall programme and our organization will retain the name PM Air Warrior. Air Soldier is the next generation that is three increments based on Technology Readiness Levels. We want to have 25 percent less bulk on the aircrew members and about a 20 lb weight saving.” The current weight, with the inclusion of body armour is 75-78 lbs. Addressing the order of acquisition, Lt. Col. Klinkhammer said, “The first thing we are looking at is the helmet and enhanced lightweight battery power to drive the wearable cooling unit.” The wearable cooling is an untethered solution for the crew members in the rear of UH-60 and CH-47 helicopters who currently must be tethered to a 13 lb aircraft-mounted cooling box. Lt. Col. Klinkhammer said, “That way they can walk around the Blackhawk or Chinook without being tethered to that box. That is the only wearable power element to this first increment but eventually wearable power will drive everything worn by the aft crewmember: communications, cooling, oxygen, a wearable display, the whole works.” Fuel cells are one of the candidate power technologies being considered. For Air Soldier head-borne equipment, the PM has embarked on a programme that will seek to improve upon the protection provided by the current Army helmet in the first increment, also seeking improvements in weight if possible and providing improved field of view and laser eye protection for particular wavelengths. The final Air Soldier increment provides a true Modular Integrated Helmet and Display System (MIHDS) including fully integrated eye and respiratory protection (face plate concept); introduction of a digital day/night Head Up Display common to all aircraft platforms; improved night vision systems field of view (from the current 40 to 90+ degrees) and increased laser eye protection (increasing to 5 to 7 fixed wavelengths of protection). All crew members will gain computing enhancements through their Soldier Computer Module – a centralized data processing and storage module small enough to fit in a pocket and a Personal Display Module (PDM) a wrist worn display with integrated data input device or interface for all Air Soldier components. In terms of external communications capability, although quite capable, the combat search and rescue radio worn by the crewmember is bulky and heavy. Under Air Soldier this capability (and that of the AWIS) will integrate into circuit cards and repackaged to a smaller and lighter form factor called the Radio Interface Control Module, envisaged as being the size of a cigarette packet with a goal of fielding as part of the final Air Soldier increment in 2018. 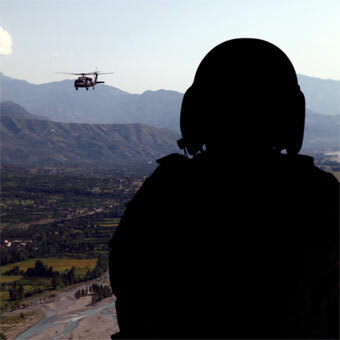 The final increment of Air Soldier and focuses on the full integration of Air Soldier capabilities necessary to exceed the threshold requirement for weight and bulk reduction and provides improved safety and soldier survivability, increased situational awareness, and reduced pilot/crew member workload. In terms of clothing, the third and final increment will field an Integrated Protective Ensemble (IPE) that replaces the Air Warrior survival vest and overwater survival equipment. The IPE fully integrates a wiring harness assembly into the duty uniform, and integrates body armor, gear carriage and extraction, chem/bio protection, and optimizes distribution of body worn mission and survival, evasion, and escape components.